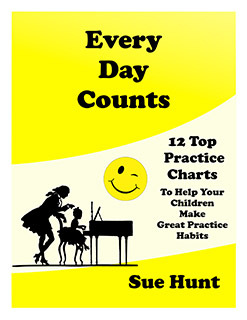 Every Day Counts when you use our 12 Top Practice Charts. This collection of colourful will be just what you need to motivate both you and your children to practice with a purpose. Make every day of practice count! 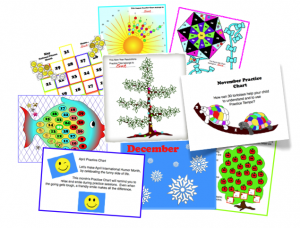 Here are twelve brand new practice charts, one for every month of the year. Each chart features a different focus point, to help you to make practice entertaining and productive: Goal Setting, Listening, Teaching Points, Being Specific, Muscle Training, Review, Micro Practices, Gratitude, Practice Tempo, Humour, Self-esteem and Good Behaviour. By the end of a whole month of practice, your new practice skill should be well on the way to becoming a habit. All you need to do is to print out this month’s chart and get practicing. If you stick to the focus point of the month, I can really guarantee that you will be delighted by your new practice habit. January presents five basic New Year’s practice resolutions. If you are brave you can add some more. There is even a micro practice insurance policy to help you through the month. February is all about listening to the music that you are learning. Did you know that when you listen every day, it actually helps the music to fall from your fingers? March helps you to remember your weekly Teaching Point at every practice. Your Teaching Point is the most important Practice Task of the week. April’s chart will help you to relax and laugh. Just open each days window after practice and enjoy an April joke. May brings an entertaining way of training your mind and muscles to produce the results that you want. June helps you to remember your best smily behavior. Keep it short and sweet and let your child assess how well it went. July is National Ice Cream Month. This month we are going for yummy, quality practice. Rather than for clocking up hours of random practice we are focussed on making highly specific, achievable practice goals. August is all about the power of micro practices. How many 5 minute slots do you have in your day? September gives you a lovely opportunity to say thank you for all the wonderful things that you are achieving in each days practice. October brings self esteem through reviewing the pieces that you know and love. Improving our performance always develops ability. November is “Practice Tempo Month.” How many Practice Tasks can you perform at Practice Tempo, the speed at which it can’t go wrong? 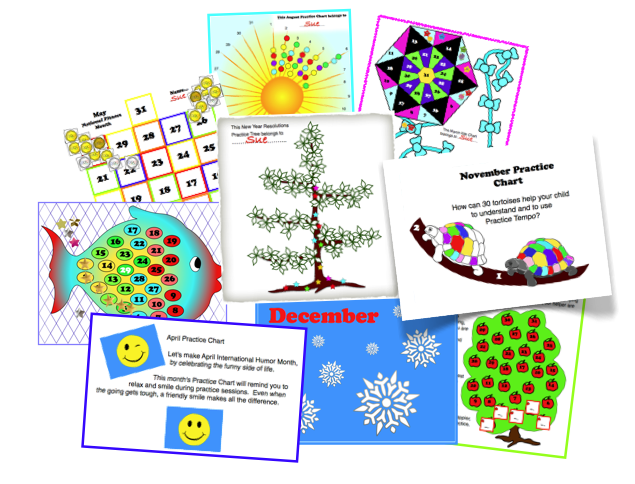 December’s Practice chart finishes your Year of Great Practice with Christmas cracker jokes to help you relax and giggle.